Beautiful, durable, and versatile, the Ride Baretta Snowboard is an all-mountain masterpiece. The Baretta features Ride's All Mountain shape that gives you rocker in the nose and a level micro-camber zone extending under the feet and through the tail. The Baretta is built with Ride's Slimewalls® and Carbon Array 3 laminates to give you excellent control and durability for a board that won't break the bank. 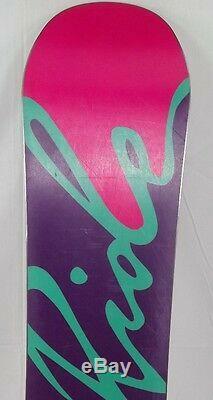 This snowboard is used and has scratches and nicks from normal use. A great board for a great deal! 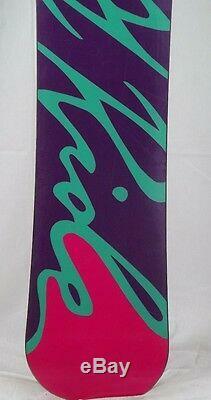 The item "12-13 Ride Baretta Used Womens Snowboard 148cm #223162" is in sale since Tuesday, September 17, 2013. This item is in the category "Sporting Goods\Winter Sports\Snowboarding\Snowboards". The seller is "demo-skis" and is located in Denver, Colorado.